Since the passage of NAFTA peasants have been treated as marginal ﬁgures for Mexico’s economic growth and as objects of social re-engineering. One of the most insidious aspects of this social re-engineering is the introduction of ideas about “gender progress”, which are intended to re-educate the rural poor to form the kinds of gender relations that can presumably lead to economic progress and a vigorous citizenry. I draw attention to the contradictions between state formulations of “gender progress” and the racialized and gendered labor niches to which Nahuas and Teeneks of the Huasteca region and Monterrey, Nuevo León are sidelined. 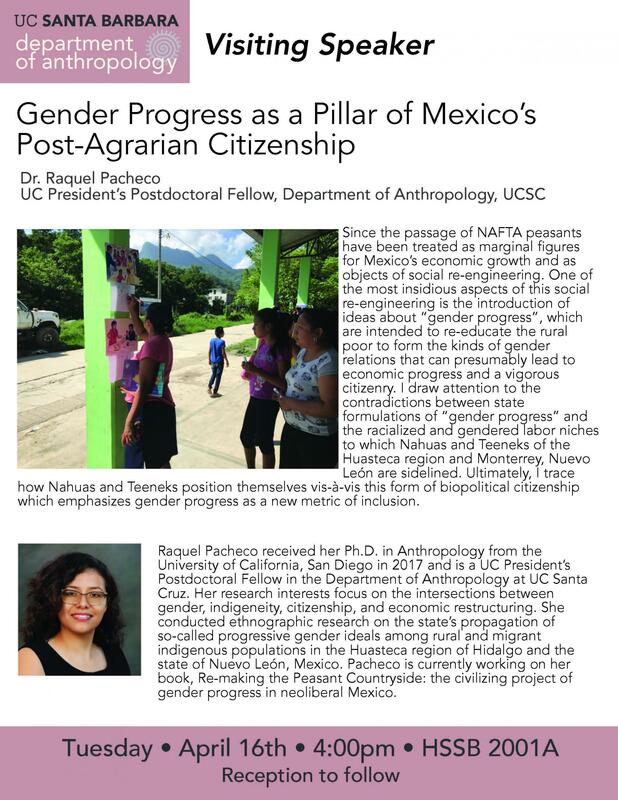 Ultimately, I trace how Nahuas and Teeneks position themselves vis-à-vis this form of biopolitical citizenship which emphasizes gender progress as a new metric of inclusion.